Bars n' Brownies, Candyland, We Scream for Ice Cream! Theoretically, we’re halfway through the summer after July 4th. But since the school year here didn’t end until June 20th, we’re not at the halfway mark yet. Nope, no siree! It’s in the 90s, my schedule is more flexible, and I’m getting in lots of quality family time! There’s something really satisfying about hanging out with everyone when the weather is hot. We can log in lazy pool days, enjoy evenings in the cul de sac after dinner blowing bubbles with all the extra sunlight, and stop looking at the clock so much. We can also pause for afternoon ice cream snacks, and let’s face it. Those are the best. Right now my freezer is fully stocked with EDY’S® Butterfinger Peanut Butter Cup Ice Cream and EDY’S® Baby Ruth Ice Cream, and they’re getting a lot of attention. How could they not, when they’re inspired by two of my favorite candy bars? 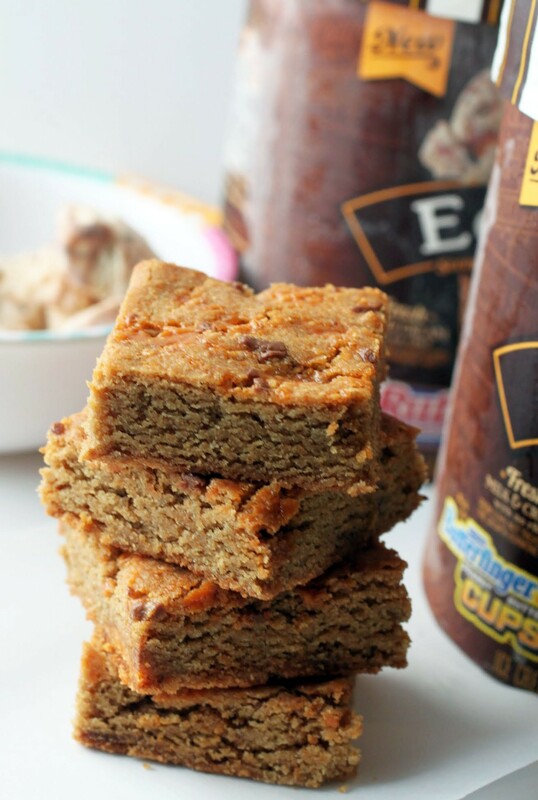 Since you all know I’m the biggest bargirl ever when it comes to baking, I made a batch of Butterfinger® cookie bars to go along with my ice cream. There’s pretty much no greater combination in life than a good dessert bar and a bowl of ice cream. Cinco de Mayo is Thursday? Aaaaaah. Not ready! Well, I am planning on slamming back some five-dollar margaritas, so does that count as being ready? Maybe I’m okay. But in all other respects, I haven’t been baking my way ready. It’s all Passover’s fault. But now that’s over, so this no-strings-attached party can get some love! 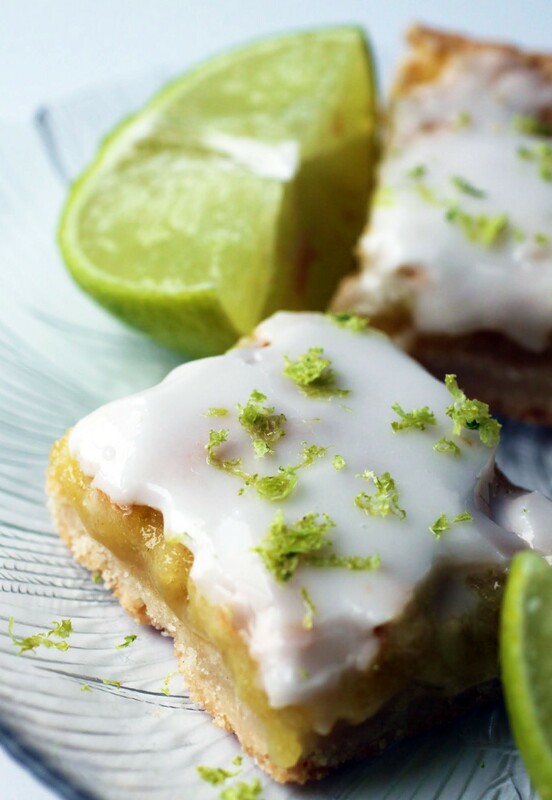 People love lemon bars at picnics, but that’s only because they’ve never met lime bars. If given the choice, I’ll go for lime every day. It’s so much more refreshing, and it pairs beautifully with a frozen margarita. Salt on the rim, of course. Bars n' Brownies, C is for COOKIE!, Passover Edition! It’s that time again, my lovelies. Passover is upon us! What kind of friend would I be if I didn’t give you some recipe love? As I’ve mentioned, this is the most challenging food week of the year. I don’t like matza or anything that tastes like it, so my Passover philosophy is to avoid cooking or baking with it as much as possible. Instead, I use nut flours and potato starch, which taste much closer to the real deal. Every year I buy a new recipe book, and this year I got Paula Shoyer’s The New Passover Menu. 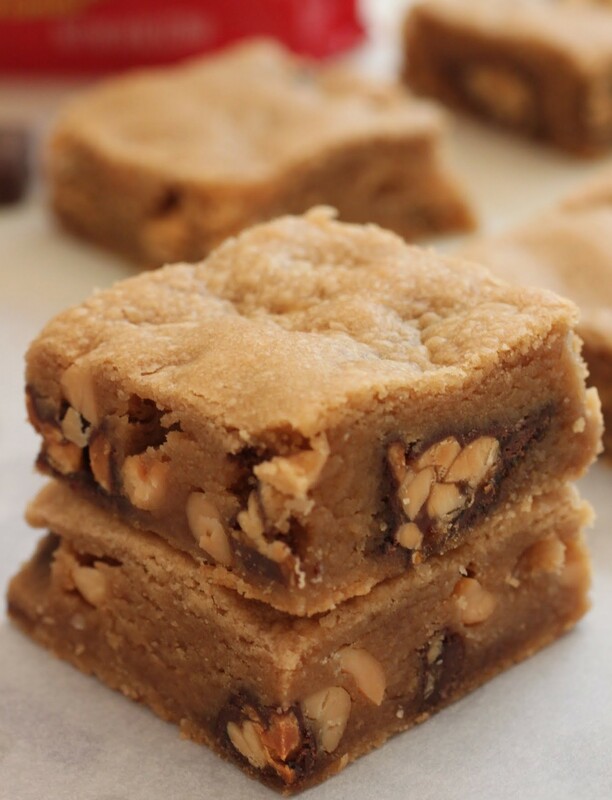 It’s an incredible cookbook, and it includes these cookie bars. My holiday is now officially better! I’m back! Back from sunny Florida, refreshed and ready to work again. Well, sort of. I mean, I’m not ready. But this is the closest I’ll be. We can’t spend life on a beach. Or maybe we can’t. I keep wondering if I could change my life and live on a beach. I mean, they need teachers everywhere, don’t they? While I’m contemplating a change in location, I might as well bake. In fact, it’s one of the things that keeps my life grounded. Whether I stay in colder climes or not, I will always love crumb more than anything. These bars are all about the oatmeal crumb, which sandwiches a layer of fudge. The whole thing gets topped off with M & Ms. Did I say these were happy? Or was that just too obvious? Yay for beautiful bars. Yay for holidays to bake them for. And yay for toffee most of all! Everyone’s busy making holiday toffee, but I didn’t feel like taking out my candy thermometer and dusting it off. Dusting is boring. 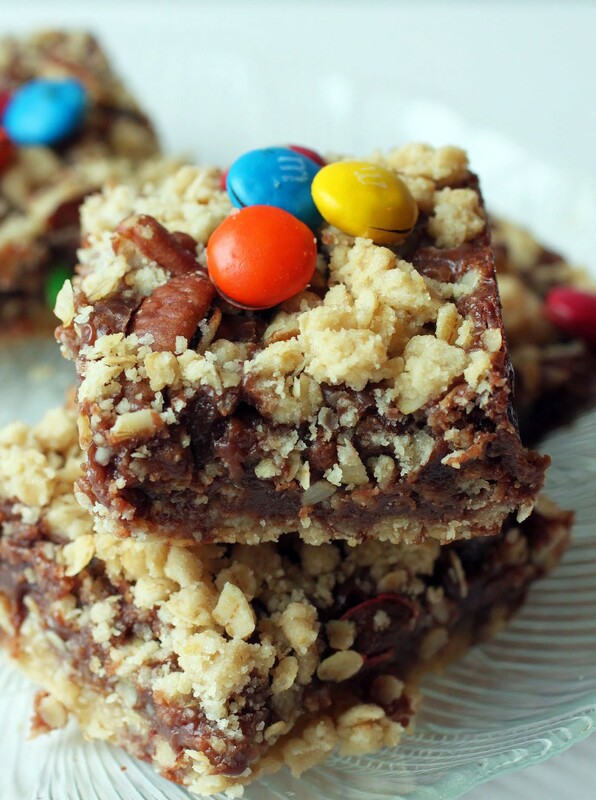 Instead, I cheated with these amazing cookie bars. You will not want to stop eating them, but that’s not really a problem. Covered in butterscotch goodness and crushed toffee, I can’t imagine a better holiday cookie offering. I mean, I’ve made a lot of different bars this season, but this one is above the ordinary bar. Cinnamon is the best right now. Anyone agree? And with the warm flavors of brown butter, it’s even more of a life necessity. In bars, to be specific. Soft, lovely blondies. If we’re talking dangerous, these squares of heaven are it. Not that you should run away now. Come closer. Take a look! Marzipan is one of those love-it-or-hate-it treats. I’m really hoping that most of you love it, since it’s one of my favorite things in all the world. If you catch a whiff of almond extract and you want to drink the bottle, then you love marzipan. If not, well, yep. Sorry. You can come back next week when I have some fun spooky treats set to go! 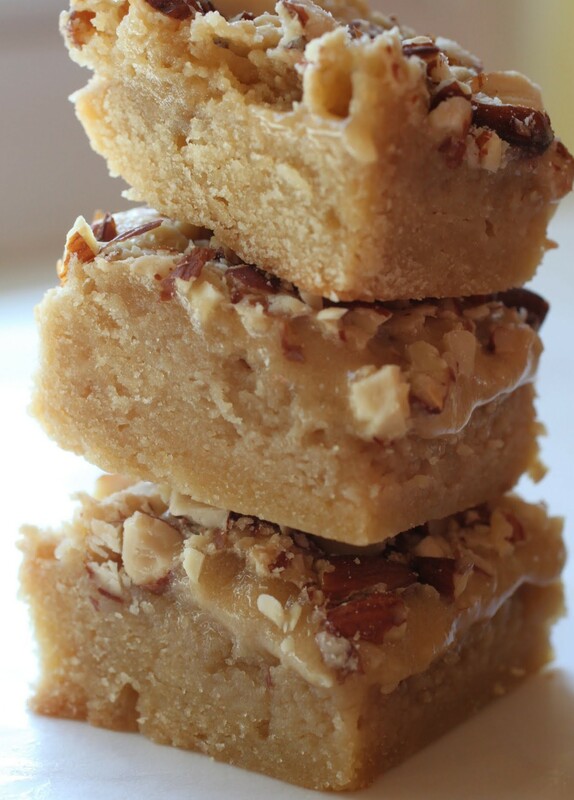 These are buttery cookie bars topped with a gooey layer of baked marzipan and toasted almonds. I’ve had to hide these in a dark corner of the freezer to avoid consuming every last one. I have a lovely autumn offering for you today. In case you’ve forgotten, butterscotch is an awesome fall flavor. 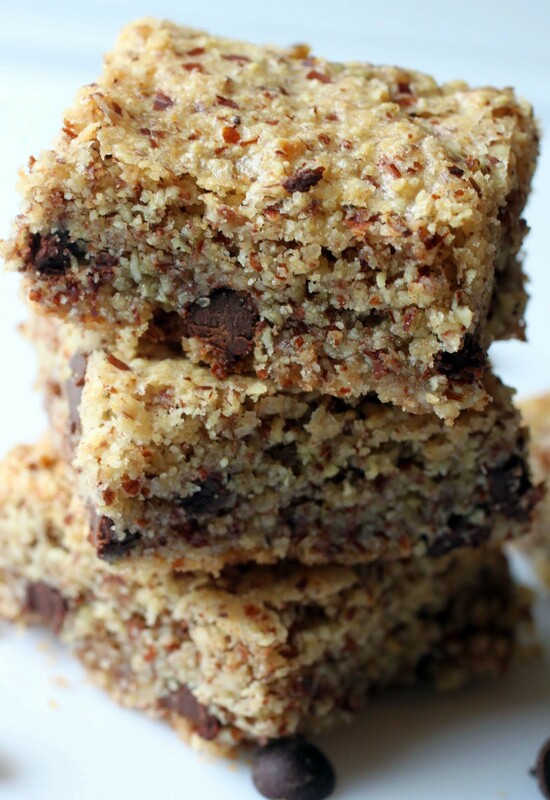 Just imagine eating these cookie bars by a fire pit while the leaves crunch underfoot. Or, you know, hidden in a closet from your kids. Whichever image suits you best. 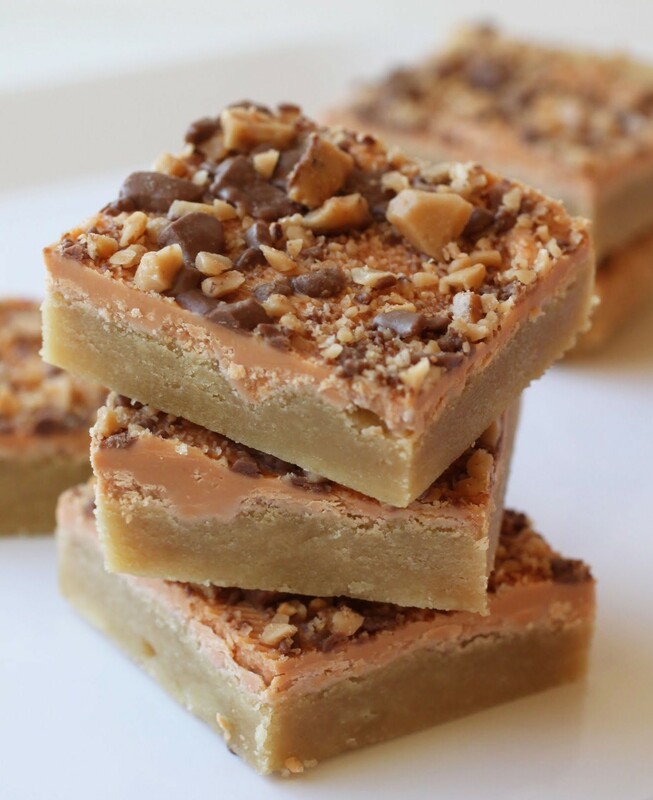 I can’t think of a happier way to highlight the superiority of butterscotch than these thick cookie bars. 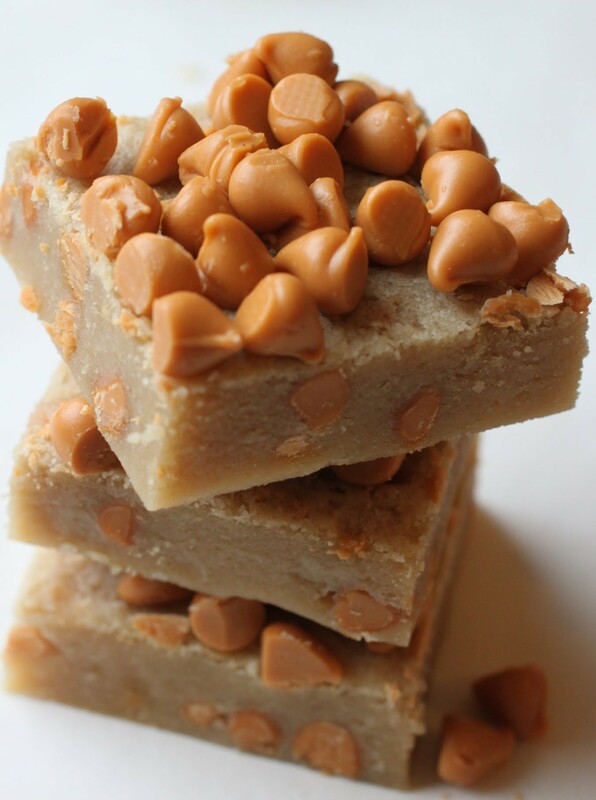 They’re chock-full of butterscotch chips and topped off with even more of the stuff. Say hello to my new favorite bar cookie! Has anyone heard of Goldenberg’s Peanut Chews? If you have, you probably love them as much as I do. They’re an old-school candy bar with a peanut and a molasses-like chewy center covered in chocolate. They’ve been around for quite a long time. I happen to know that because my ancestors were chewing down on them back in the earlier part of the 20th century. There are some family stories that center around these candy bars. Like, back in the day, they were apparently very hard to actually chew. Nowadays they’re softer, and I’ve always loved them. 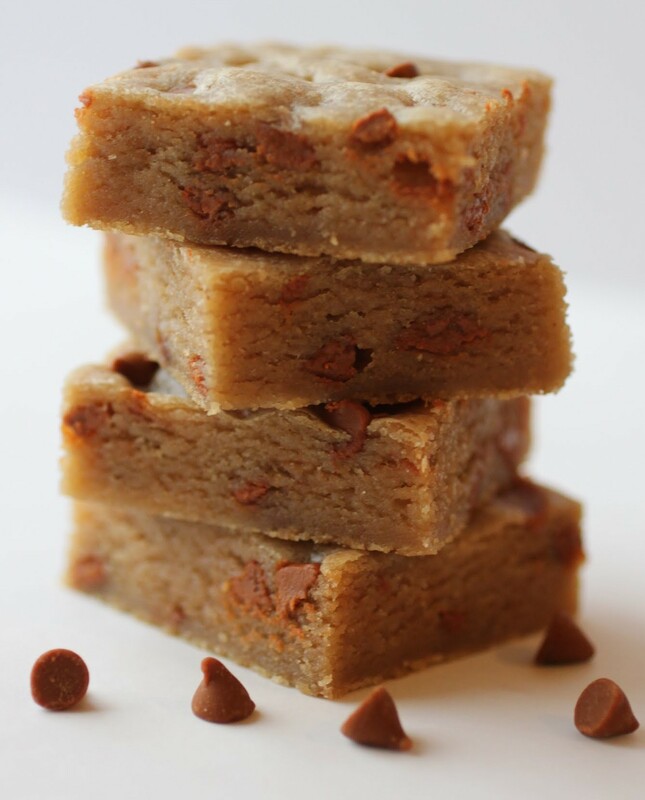 So I had to put them into a soft, dense, thick peanut butter cookie bar! 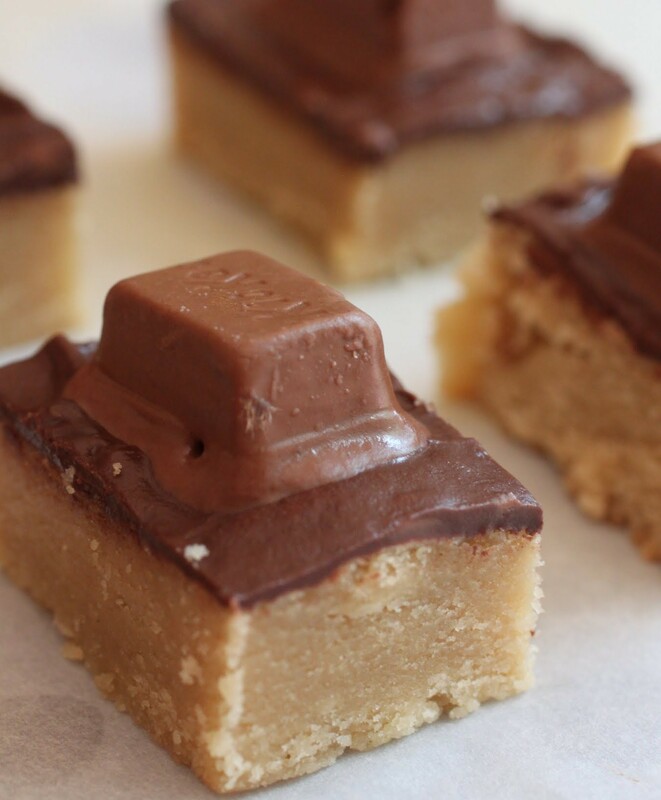 These peanut chew bars are full of the candy and peanuts, too!